Black jumpsuits and glitter for Christmas are a favourite of mine, almost as good as a tulle skirt with a jumper but I'll cover that in the next blog!! There are now only 5 days to go until Christmas - AGGHHHHHH!!! I am not organised at all but have had time today to research some jumpsuits and knock out this blog, wrap three presents, do the Christmas lunch shop, send presents to family - I'm nailing it! Jumpsuits are a total wardrobe staple and a really good choice for this time of year, sophisticated, stylish, cool, all the adjectives I want to be or wish I was!!! 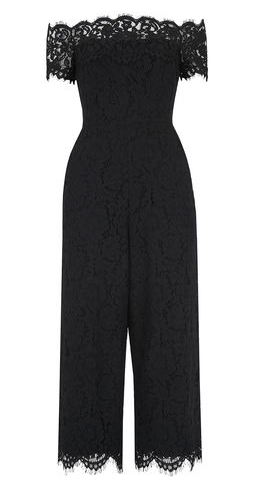 A good choice for Christmas Day, for drinks parties and for NYE - LOVE a jumpsuit. Also good if you're someone who doesn't do colour and doesn't like getting your legs out. I've chosen black jumpsuits 'cos black is classy in'it! and if you add sparkly heels and do a colour pop with earrings this will look really good, simple! Here are some of the best in the shops right now in time for Christmas. 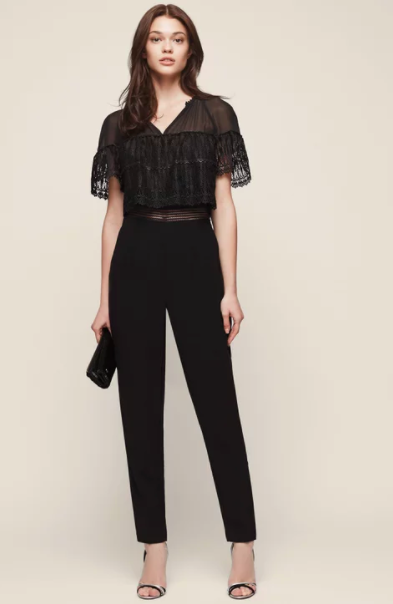 If it's too racy/chilly to go for an off-shoulder number then how about this gorgeous lace sleeve jumpsuit from Reiss or below that a really smart cropped leg jumpsuit by Self Portrait at Selfridges. The cropped leg looks great over boots as a warmer option than heels - always thinking practicalities. Back to Whistles again - I can't get enough of that shop at the moment. This is a more low-key option than the above but would be really quite practical and comfy as well as glam which is more my own style. I'm not someone who likes a really dressed-up look so this appeals to me a lot. Finish off with some fully glitter heels, sparkly earrings and a trusty leather jacket. 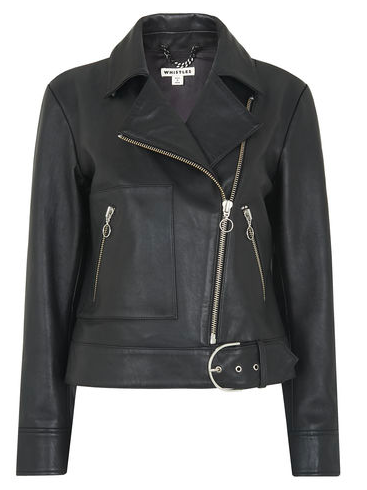 I know a leather jacket isn't warm enough on it's own at this time of year but they layer beautifully under coats. Lisa Gillbe is a personal stylist and shopper based in London. If you would like help with your wardrobe get in touch to find out about the shopping and styling services and see how we can help you.